the small guide site's blog of English lessons: Happy FOURTH OF JULY! 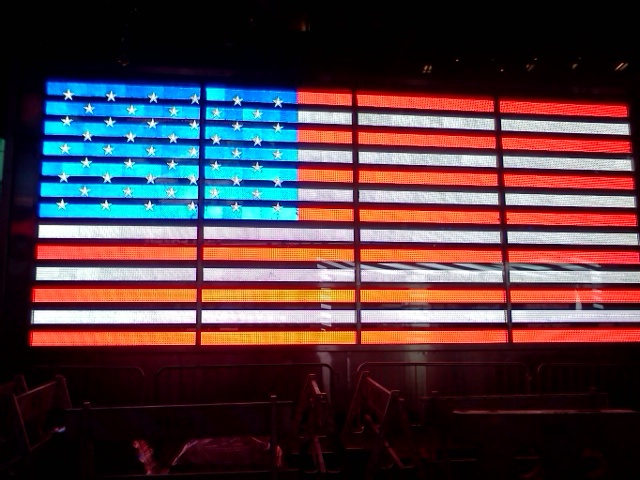 The flag at the U.S. Armed Forces Recruiting Station on Times Square. It's the FOURTH OF JULY, and the United States is 237 years old! We declared our independence from Britain on July 4, 1776. Understandably, a lot of American flags are proudly being flown and waved today at events nationwide. There are parades, backyard barbecues, and of course, fireworks! Have you been to a Fourth of July celebration? What was it like? To make your July 4 memorable and meaningful, here is some information about the U.S. to keep in mind. 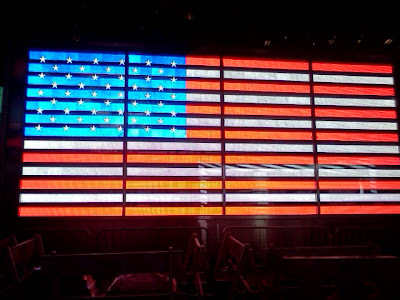 The U.S. flag has 50 stars, which stand for the 50 states in the Union. The flag also has 13 stripes, which stand for the original 13 colonies. The flag is also known as the Stars and Stripes. The first President of the U.S. was George Washington. The first President to live in the White House was John Adams, who was the second President and the Vice President under Washington. Washington, D.C. was strategically selected as the nation's permanent capital to APPEASE (make calm or peaceful) both the North and the South. D.C. stands for District of Columbia; the area was once called the Territory of Columbia, named in honor of Christopher Columbus. Also, "Columbia" was once the poetic name of the U.S. Thank you for the information, very interesting, as always. Have a great summer.